About a month ago, I mentioned I was thinking of getting a container berry bush. I only got one thinking the chance of its survival was slim to none. Well guess what? You have no idea how excited I am. I grew something edible despite my complete lack of ability and general unfit plant mothering. Obviously this bush was impossible to kill so I take no credit for it but it's still the most exciting snack I can remember. A little jealous over here. 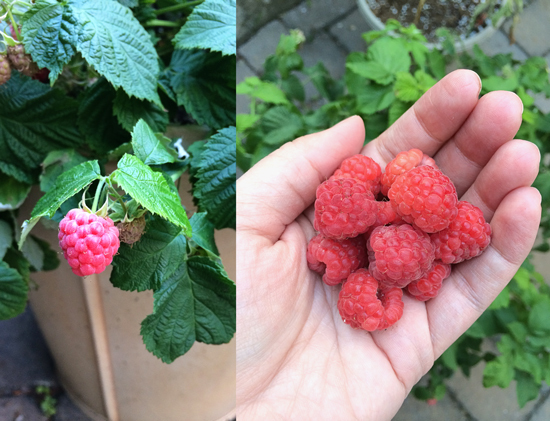 After 3 attempts to grow raspberries in a container, I finally gave up this year. I refuse to plant them in the yard, as I understand they can be invasive. Enjoy your bounty! Yay! Freshly picked raspberries are the best!!! They are very easy to grow and I dont find them that invasive. We have soo many fruits right now, my spoiled parrot oonly eats those and not store bought ones. I planted a garden this year - tomato, herbs, string beans, etc. It is not too big, just right for us. I am still waiting for something to grow. If you hear screaming and shouting in CT you will know I harvested something. Next year I will try strawberries. That's awesome. I am a plant killer. You give me hope. Just curious if you went with a Brazel Berry bush? I saw some shortly after you posted about them but I held off on buying one. If they're that easy to grow I might get one next year!